From black tie to backyards and in between – a handy guide to dressing to impress in a variety of wedding situations. Have you noticed how these days “wedding season” seems to be expanding beyond the standard summer months? Tropical destination weddings in the winter (nice vacay opportunity, thank you very much! ), harvest-themed weddings in the fall, garden weddings in the spring. More and more, folks are picking the time of year they love, or that works for them, not when the time is set by tradition. Climate zone, season and circumstance will all dictate the dress code for a wedding. And because we’re overgrown boy scouts at heart, we assembled a handy guide to dressing for a few popular wedding styles so you can always be prepared. Usually an evening event, Black Tie weddings can happen any time of year, but often pop up in cooler months, so no one suffocates in their formal layers. Probably the most formal invite the majority of us will ever get (Oh what, you’re having dinner with the Queen? 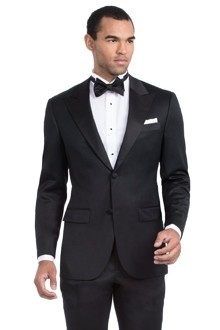 Okay, break out the white gloves and tails), Black Tie means one thing: Tuxedo. Choose a vest or a cummerbund to go with your penguin suit, practice tying a real (black) bow tie, and shine up your patent leather shoes. You’re gonna look and feel like royalty. See our favorite black tie looks. A quick and easy civil ceremony can happen any time, and is growing in popularity – Matt Damon, Giovanni Ribisi, Keira Knightley and Wiz Khalifa have all tied the knot with a justice of the peace and minimal fanfare. Just ‘cuz you’re eloping doesn’t mean you shouldn’t dress up. Take a page from Joe DiMaggio’s playbook for his civil ceremony wedding to Marilyn Monroe and opt for something subdued and classic. 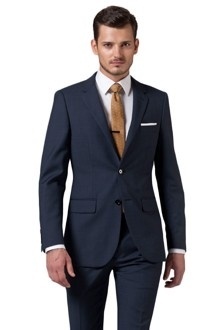 A single-breasted suit in a dark color like charcoal or midnight blue should do the trick. 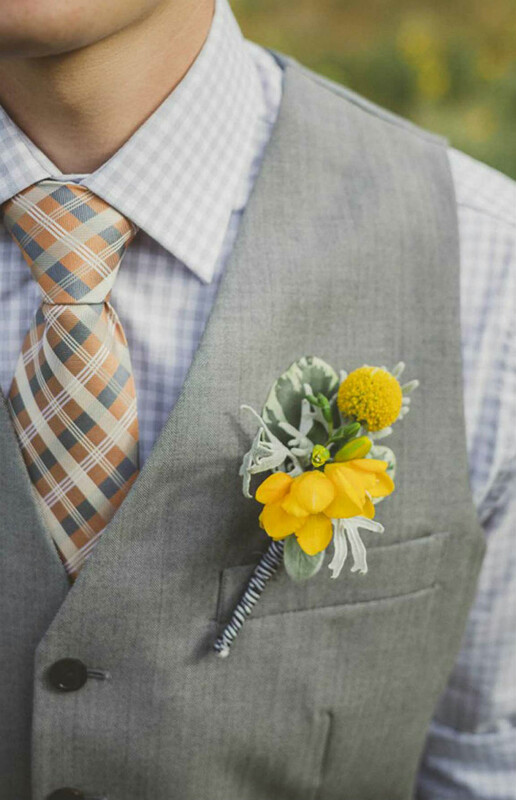 Find a tie or pocket square that matches the bride’s outfit to emphasise the significance of the moment. See our favorite civil ceremony looks. Garden weddings most often take place between spring and early autumn, depending on where you are and which months of the year are warm enough to party outdoors. Many more degrees of casual below Black Tie, your typical garden wedding allows you to walk the line between formal and casual, and hopefully have a little fun while you’re at it. 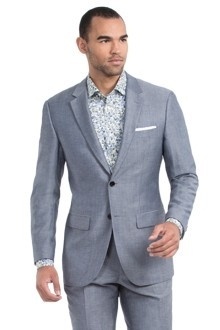 Grab a lighter colored suit (we really like blue right now, but tan and gray work, too), a tastefully patterned shirt, and round out the ensemble with brown leather shoes and a bright pocket square. Breezy. See our favorite garden party looks. Tropical weddings are most popular during winter, because who wants to go somewhere that’s 110 degrees when it’s t-shirt weather at home, right? From Florida to Hawaii, Mexico to Jamaica, no one is mad at a tropical wedding. Hot weather does present a slight challenge to dressing formally, so choose lightweight and breathable fabrics and you won’t have to sacrifice style for comfort. A linen button-down shirt and light colored dress pants are fine, or choose a linen or cotton blended suit for a more put-together look. Ties are often optional in this setting, just save the cargo shorts and Hawaiian shirts for after the wedding – you’re better than that. See our favorite sun destination looks. is the leader in custom online menswear. 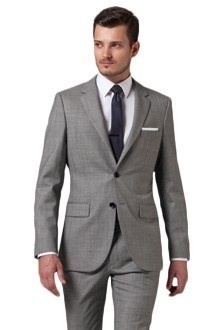 They provide the modern gentleman with high quality menswear that fits your body perfectly. Indochino makes it easy and affordable for customers to get custom tailored menswear for a look that is professional, fashionable and truly sophisticated. 1. A gorgeous option for the groom looking to stand out is the indigo kiku skinny tie from Kiriko Made ($89), the Portland-based boutique located in the heart of Chinatown.